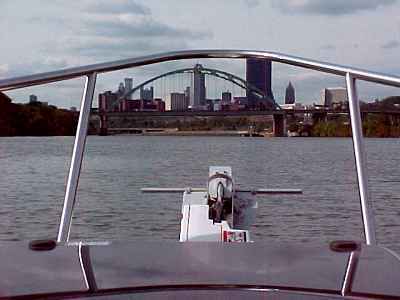 -----El quickly decided that the Monongahela River should have equal treatment from Halcyon as the Allegheny. Therefore, we cruised up the Mon (as locals call it) as far as its first lock. 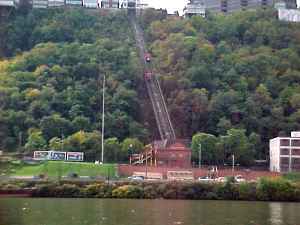 -----We rounded The Point, with its beautiful fountain and park on the site of Ft. Pitt, and started up the Monongahela River as far as the first lock. There are eight more locks and dams above on the navigable 128 miles of the Monongahela. In the language of the indigenous people, Monongahela is thought to mean 'river of falling banks', and it is well named. The waters were turgid and so murky we couldn't see our propellers. Too late in the season to continue, we reluctantly turned back to The Forks. -----With the advent of steamboats, it became evident that the navigation channel of the Monongahela would have to be improved. While the government dithered and studied the problem through the 1830's, a private company built seven dams and locks and charged tolls for passage. In 1897, the US government bought out the company and built eight more dams and locks. Improvements made in the early 20th century reduced the number of dams and locks to the present nine. 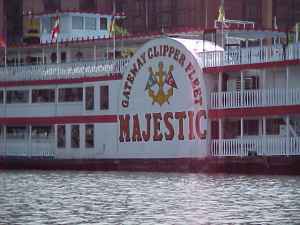 -----Our cruise on the Monongahela was a delight. The views downriver to Pittsburgh were marvelous. 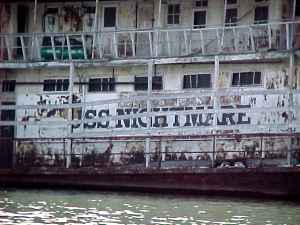 The first steamboat on the Ohio System, the New Orleans, was built on the Monongahela in 1823. Paddle wheelers still lined the left descending bank. -----Behind the paddle boats, the land rose to the Heights and several inclines were active carrying folks up and down the steep slope. 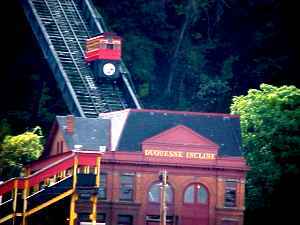 My mother rode the Duquesne Incline as a child when she lived on the Heights.